Inspired while protesting the invasion of Iraq in early 2003, this is one of our first buttons. 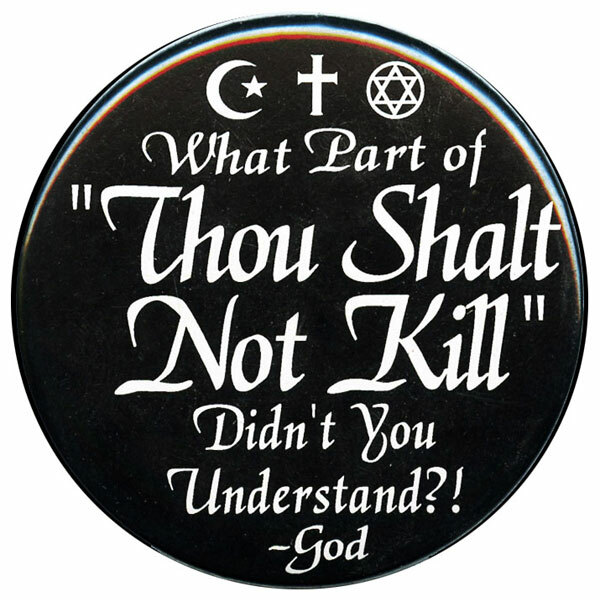 The Bible doesn't qualify it is OK to kill as long as it's another nationality or religion. Killing is killing. Now they do it electronically - with unmanned drones. Insideous and horrific, these drones should be an OUTRAGE to all who see what's right and what's wrong, no matter their religion! It is going on a decade of investing in these wars, with no end in sight. It has to end sometime, so how about NOW?